Lady Antebellum's Prom gig, A southern Indiana high school wrecked by tornadoes won a free concert by country music stars Lady Antebellum on Tuesday thanks to a rival school that, along with students in other states, advocated on the battered school’s behalf in an online contest. Schools from as far away as northern Wisconsin submitted YouTube videos urging the Grammy-winning group to choose Henryville High School in the band’s “Own the Night” contest offering the winning school a concert at its prom. Henryville’s schools were heavily damaged when powerful tornadoes ripped through the region earlier this month, killing 13 people. “It meant a lot to us and made a lot of people cry. Knowing there’s that many people out there that cared to give it to us instead of their own prom,” said 17-year-old Henryville junior Daniele Kats. Lady Antebellum said the band was touched by Henryville’s “story, resilience and unity following devastating tornadoes.” Because of a scheduling conflict, the trio won’t be able to perform at Henryville’s prom on April 27, so a concert will be held for juniors and seniors in nearby Louisville, Ky., on May 16, followed by a benefit for the community. 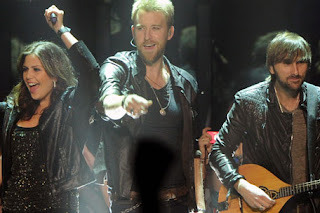 Lady Antebellum singer Charles Kelley said Henryville students shouldn’t be disappointed that the band won’t be able to visit their community. The trio, rounded out by Dave Haywood, won best country album at this year’s Grammy Awards for “Own the Night,” and took home several Grammys last year, including record and song of the year for “Need You Now.” Details about its Louisville concert will be released soon. Other video entries supporting Henryville came from D.C. Everest Senior High School in Weston, Wis., and from Harrisburg, Ill., where a tornado that struck Feb. 29 killed seven people. Harrisburg students said that despite their community’s loss, they decided to back Henryville’s prom bid. Henryville art teacher Amy Fischmer, the prom committee’s co-chairwoman, said her students were “grateful and happy” about the outpouring of support on the school’s behalf following the devastating storms on March 2. Mary Beth Coffman, Silver Creek’s mass media teacher, recruited three of her students to be the video’s stars and spent two days filming in Henryville for the video.